You are here: Home / Futures and Options / Is Bank Nifty Signalling a Short Term Top? Nifty and Bank Nifty futures both ends the week with a gains of 0.9% and 2.4% respectively. And Bank Nifty futures shown 7 weeks of continuous positive gains. Nifty and Bank Nifty futures both maintain the prolong positional buy mode(more than a month in case of Bank Nifty) with the support zone comes around 8344 and 17719 respectively. Reverse your positions to Positional sell mode if the support zone breaks on the hourly charts. 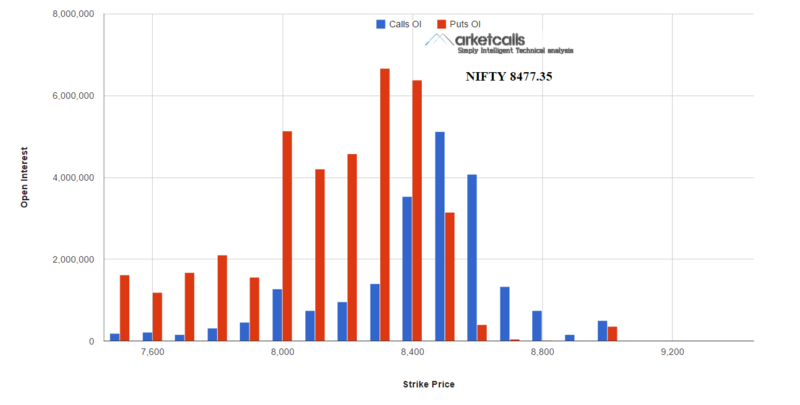 The Open Interest paints a bullish picture as both 8300PE and 8400PE writers remain strong so far. And 8400 could be the support zone for current month expiry. What do you mean by front load? Is it a backfill? If you mean backfill then yes it is possible. Market makers/FII seem to know the precise level that can trigger a trailing stop loss to get hit to sustain an rally they ensure that levels are not broken beforehand. Further since all supply only comes after the complete trend is over strength of the bull run is maintained till actual reversal does not take place. I think there has never been such kind of market consensus in Indian market on market direction.